Do you currently partner with a DSP to engage your target audiences programmatically? Maybe you use more than one DSP? Or are you unsure of who you might want to use? In AccessHCP, we’ve got you covered either way! 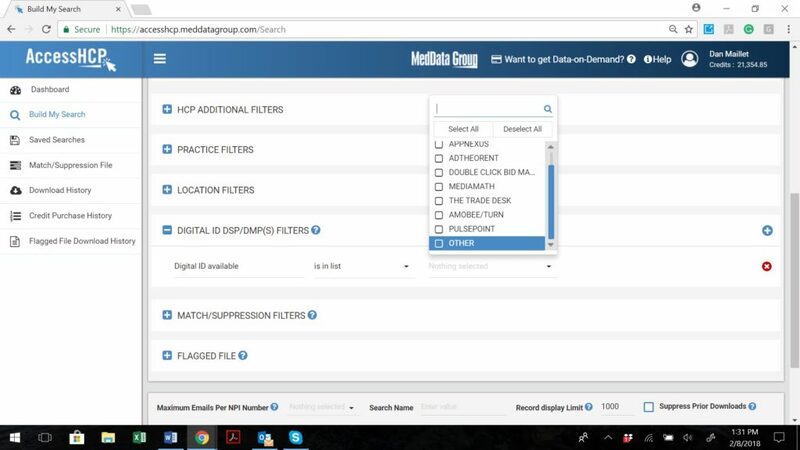 If you are doing a raw search, you can select one DSP, or multiple DSPs to assist you with planning for your upcoming campaign. However, if you select multiple DSPs, keep in mind that the DSP that yields the highest number will be the count that will be given when you search. First, select “Core + DSP Search” in “Build My Search”, then select all necessary filters. Then, select either one or more DSPs under “Digital ID DSP/DMP(S) Filters” and hit Search. You can also select “Other” and that will give you the highest count out of all DSPs. Keep in mind, the most accurate count will be to choose just one DSP.